A group of Los Angeles Filipina women ("Pinay") from different backgrounds, industries, and generations -- each one making her mark in her own right -- gathered one afternoon through their common connection with Filipina Women's Network. Through this gathering, we decided to organize and put together an event that would serve as a supportive and collaborative space for Pinays to work together for empowerment across industries and across their public and private spheres. 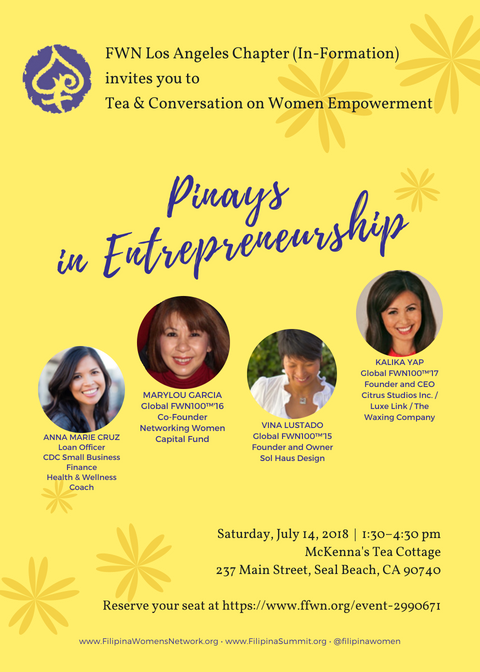 The topic of our upcoming event is "Pinays in Entrepreneurship," and we chose this topic for our event because our Filipino community as a whole, historically and presently (particularly Filipina women) have largely been identified as a labor force, a commodity, and not often been seen as leaders, innovators, and business owners. We would like to change this image by providing a platform that can serve as a resource for our community to create, to build businesses and institutions and to achieve the freedom of paving our own path on our own terms (the "pursuit of happiness"). We hope that this event will catapult other events grounded on collaboration and empowerment. That said, please join us for a relaxed and engaging afternoon of shared experiences, creativity, insights, and supportive collaboration. Provided below are short bios of our guest speakers, Marylou Garcia, Vina Lustado, Anna Marie Cruz, and Kalika Yap. Our guest speakers will later be joined by a panel of experts from legal, accounting, finance, and marketing industries, who will serve as a resource for our guests regarding any specific questions on entrepreneurship. Marylou Garcia is the Co-founder of Networking Women Capital Fund, whose purpose is to invest, mentor and empower women entrepreneurs in early stage, high growth businesses and provide them with the capital, tools and resources to build and grow their businesses. Women entrepreneurs often face additional challenges in accessing capital markets and experienced advisors/mentors. Her fund levels the playing field, through support and collaboration, allowing women entrepreneurs to build and grow their businesses and give back to their communities. Marylou is also the Managing Director of Expense Reduction Analysts, a worldwide network of more than 600 consultants in 30 countries specializing in delivering extra profits for mid-sized companies through cost reduction. ERA’s 18,000 successful client projects show that many supplier costs can be lowered by another 10%-30% without jeopardizing existing supplier relationships or forcing them to use specific suppliers. Vina Lustado is the Founder and Owner of Sol Haus Design, a boutique design firm based in Ojai, California. With a professional degree from USC and more than 20 years in high-end corporate architecture, Vina has decided to focus her career on projects that can make a positive difference. Staying true to her core values, Vina lives full time in her self-built and self-designed tiny home. Equipped with simple luxuries, Vina manifested her dream home in 140 square feet. It reflects her philosophy about simplicity, sustainability, and living within her means. Vina’s tiny home has been featured in countless media publications, architecture books and national television, including Dwell for Design in LA. She was an invited speaker at Yale University helping to inspire young business leaders about social and environmental entrepreneurship. Anna Marie Cruz is a loan officer for CDC Small Business Finance, a not-for- profit lender with a passion for helping Main Street small businesses grow and create jobs through capital. Outside this role, Anna Marie is a health and wellness coach, helping other busy career women live their healthiest lives, after learning from her own struggles with weight loss, stress, and the one million things a woman is supposed to be in these modern times. She is also deeply passionate about helping Fil-Ams craft a healthy lifestyle to avoid diabetes and heart disease, to which she has lost many relatives. She has written articles for Asian Journal on this topic and has also been on Kababayan TV to encourage the community to take control of their health. This year, Anna Marie will be launching a social enterprise, Well Woven Life, that combines her holistic wellness philosophy in products made by artisan weavers from around the world, including the Philippines. Kalika Yap is the Founder and CEO of Citrus Studios, Inc. / Luxe Link / The Waxing Company. She founded Citrus Studios, Inc. in 1999, an award-winning interactive design and consulting agency focused on the development and implementation of engaging and effective web sites for corporations, institutions, museums and universities. Citrus Studios counts the Annenberg Foundation, USC, UCLA, and Children’s Hospital Los Angeles as some of their clients. Kalika is also the inventor and patent design owner of Luxe Link, a unique fashion accessory responsible for keeping thousands of women’s purses off the floor. Luxe Link has been featured on the Today’s Show and is available in over 70 International and US stores, as well as online. In 2009, Kalika took a leap of faith and launched a new business – The Waxing Company; the first high-end waxing company to arrive in Honolulu. Kalika’s conservative projections of profitability were proven wrong when she turned a profit within 120 days of launch.